Some more entries for VV in the Wild free t-shirt giveaway have come in, and they're fantastico. shirt all up in da club. 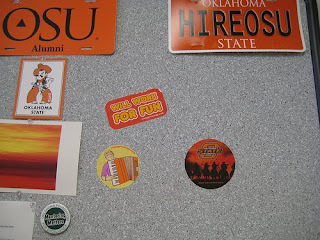 Our friend JJ spotted a bunch of VV stickers on a bulletin board. She says: This is my bulletin board at work. I put them up to make me smile when I’m not having fun. You can’t see it but to the left is Coach’s Kitshickers Player Card. And lastly but not leastly, Brandon spotted a sticker, too. 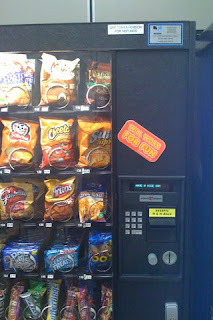 He says: "Here is a sticker in the wild, on a hospital vending machine in Tulsa, Oklahoma. When not resting this sticker can be seen stalking prey, and probably high fiving other stickers in the wild." hey winners - email James - vintagevantage@hotmail.com - and pick out your shirt and it'll be sent quick like bunny. The young man in the hippo shirt looks like a young Woody Harrelson.